Marvel is bringing the Hulk back to his roots in the new series Immortal Hulk, taking the original concept behind the character — what if you crossed Jekyll & Hyde, Frankenstein’s Monster, a werewolf and an atomic bomb? — and playing up the innate horror elements. But over the past five decades, Bruce Banner has been through countless transformations since that first gamma-powered one. Depending on which incarnation you’re looking at, Hulk might be gray or green, articulate or incoherent, the lead in a sci-fi adventure or a supporting character in a superhero team-up. “One of the greatest things about the Hulk as a character is how simple the rules are — when Banner gets mad, he turns into the Hulk and smashes stuff. And the madder he gets, the stronger he gets,” says comics writer Greg Pak, whose work on the character was a major influence on Thor: Ragnarok. 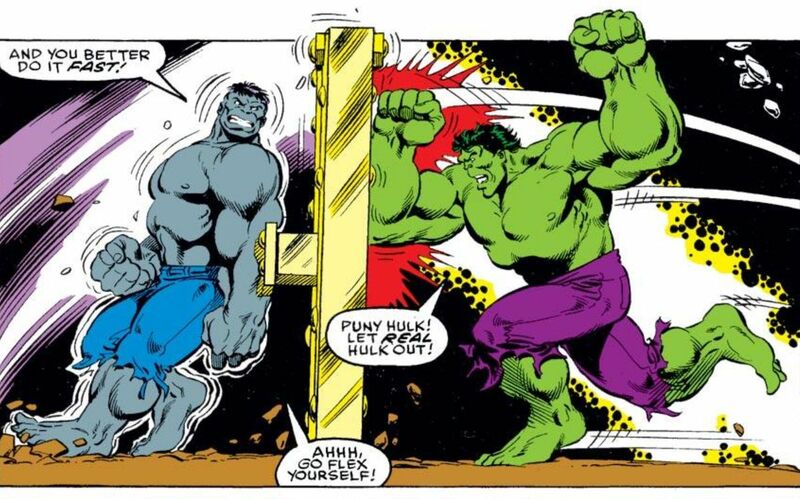 Panels from The Incredible Hulk #1. As Pak says, the rules weren’t fixed in the Hulk’s earliest appearances. In the first six issues of Incredible Hulk (circa 1962), the character bounced between monosyllabic and brainy, from slow and clumsy to fast and stealthy. The initial idea, that Banner becomes the Hulk when night falls, gets ditched after two issues, and his transformation is instead triggered by a gamma radiation machine he controls with his feet. “If you go back and look at those first issues, it’s this weird ever-changing miasma, as Stan Lee, Jack Kirby and Steve Ditko try to work out exactly what the character is and where he’s going issue by issue,” says Al Ewing, writer of Marvel’s most recent Hulk series, Immortal Hulk. “In contrast, characters like Spider-Man, the Fantastic Four, Daredevil — all of these have their status quos set in stone very quickly. Given this chaos, it’s perhaps unsurprising that the series only lasted six issues before it was canceled — an inauspicious start for someone who would go on to become one of Marvel’s most recognizable characters. Hulk was folded into a brand-new super team known as the Avengers. Hulk is nominally a founding member of the team. It’s more accurate to say that he was one of its most common antagonists, whether because of Loki’s tricks or just because he’d grown tired of the way his teammates treated him. After being supplanted by a freshly thawed Captain America, Hulk jumped from book to book, playing the role of villain in Fantastic Four and sharing the Tales to Astonish anthology, first with Ant-Man and then Namor the Sub-Mariner. Dr. Jane Cabot (Jane Merrow) in the arms of the Incredible Hulk (Lou Ferrigno) in the late 1970s/early 1980s TV series The Incredible Hulk. After a few tumultuous years, the Hulk we recognize now was cemented in the public consciousness by the television adaptation, which ran on CBS from 1978-1982. The narration that opens every episode of The Incredible Hulk lays out some simple ground rules: “When David Banner” — note the name change — “grows angry or outraged, a startling metamorphosis occurs.” And these rules more or less stuck, on TV and in the comics. “Eventually, his speech settles into the ‘Hulk Smash’ pattern we know, and we get a fairly long period of stability,” says Ewing. “Things change and evolve regarding the cast and Banner’s situation, but Banner and the Hulk are relatively fixed, as solid as they ever get. At the tail end of the TV show’s run, any viewers picking up a Hulk comic would have likely had their expectations smashed by stories like Bill Mantlo and Sal Buscema’s “Crossroads,” which sees a mindless Hulk exiled to interdimensional limbo after Banner commits “psychic suicide.” What follows is a year’s worth of stories starring a Hulk who can’t summon more than a “raargh,” bouncing between realities where he battles giant energy monsters, fairytale knights and cosmic parasites. This is literally worlds away from the Hulk’s movie-monster roots, or the grounded heroics of the TV series. But the ability to jump between different types of stories is baked right into the character, according to Pak. Pak knows what he’s talking about here — he’s the writer of Planet Hulk, a yearlong story from 2006 that saw the jade giant jettisoned into space by the fearful heroes of Earth. Landing on an alien world, Hulk is captured and forced to fight in a gladiatorial arena. He eventually bands together with the likes of Korg the Kronan and leads a resistance to overthrow the planet’s tyrannical leader. If that sounds familiar, it’s because the story was a major inspiration for Thor: Ragnarok. The latter is perhaps the most obvious core element of the Hulk as a character, right from the first issue’s cover asking, “Is he man or monster or… is he both?” But each creator has to negotiate exactly what that question means to their portrayal. In Immortal Hulk, Ewing and artist Joe Bennett are leaning hard on the “monster” side of the equation, making Hulk the hero of his book only in as much as the shark is the star of Jaws. 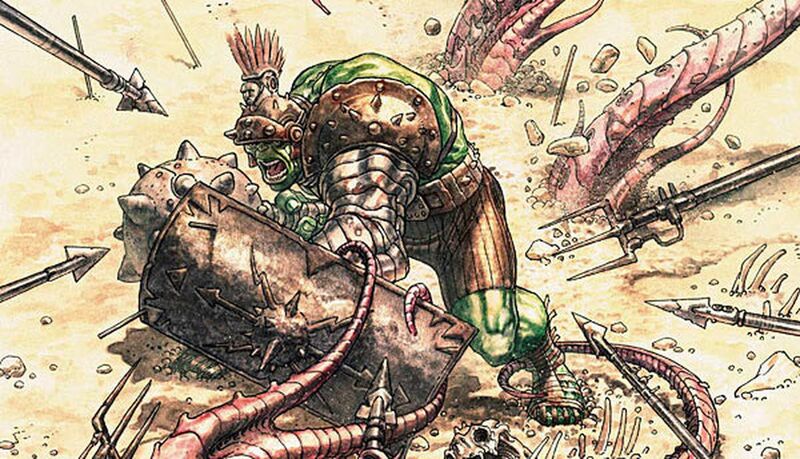 Pak’s approach is multifaceted — in Planet Hulk, he builds a supporting cast of characters who look monstrous, such as Korg and the Xenomorph-like Brood, but makes them the unlikely saviors of a planet suffering under tyranny. “Personally, I’ve always loved characters of heroes who fear the monster inside or monsters who redeem themselves as heroes,” Pak says. Morally speaking, it’s the humanoid Red King who is the real monster in Planet Hulk. But as the story reaches its end and transitions into World War Hulk — where Hulk travels back to Earth to face the superheroes who exiled him and caused the death of his wife — it becomes clear that this isn’t the simple dichotomy it initially appears. As Hulk tears New York apart, he repeats that Tony Stark and Mr. Fantastic are the real monsters, but his quest for vengeance leads him to some truly monstrous behaviour. It’s a great way of showing what happens if you live by “never stop making them pay,” and illustrating the dangers of holding onto rage for too long. Nothing positive, Pak seems to be saying, can be built on the foundations of vengeance. These core themes have been present from the conception of the character, but no creator has done more to establish them than Peter David. From 1987-1998, David wrote 134 consecutive issues of Incredible Hulk, and he has also helmed a number of Hulk annuals and miniseries. Both Pak and Ewing point to David as one of the defining voices in Hulk history. His stories span a huge range of tones and genres, but they’re united by a consistent focus on the psychological aspects of the character. David tackles the ever-changing nature of the Hulk — his transformations and intelligence levels — by splitting him in two: the familiar savage Green Hulk and the smarter Gray Hulk, who is actually closer to the original portrayal of the character. 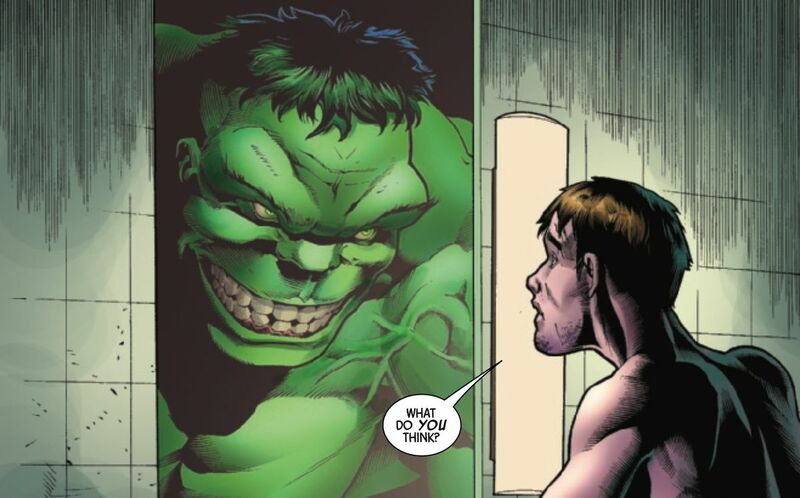 David suggests that the Hulk personality existed before the gamma accident, as a result of Banner’s childhood trauma, and diagnoses him with dissociative identity disorder. These are all major changes to the character, but they tap into precedents set early in the Hulk’s history. The first issues of the Hulk’s 1960s series have a notable lack of familiar villains — Gargoyle, Ringmaster and the Toad Men are hardly household names. By the time David writes the character, standbys like Leader and Abomination have been established, but none of them can compete with the Hulk’s primary nemesis: the Hulk himself. Over and over, David finds ways to pit Banner and the Hulk — or even two Hulks — against one another. The Green and Gray Hulks wrestle for supremacy in Banner’s mind, eventually integrating into a single persona. In the Future Imperfect miniseries, David introduces the supervillain Maestro, a twisted future version of Banner who rules over a post-apocalyptic dystopia. In The End, his one-shot ‘final days’ story, Banner is the last man on Earth, trying to overcome the Hulk transformation so he can finally die. Whether he’s leading a revolution on an alien planet, battling with a future version of himself or being resurrected as an immortal rage monster, the Hulk never remains static for very long. That’s partly thanks to the initial conception of the character, one that kept shifting even once the Hulk was constrained to the comics page. The concept is broad enough that each new writer can interpret it as they wish — in some cases, multiple times — but there’s a simple metaphor at its heart. It’s something almost anyone can relate to: the idea of losing control — whether due to anger, stress or exposure to gamma rays — and feeling like you become someone else entirely. With these themes of transformation and split identity so deep in the Hulk’s irradiated DNA, it’s only natural that the character would keep mutating over the decades. It can make diving back into Hulk history a daunting prospect, but we should celebrate this ever-changing nature. Alex Spencer is a U.K.-based freelance journalist writing about comics, games, technology, pop music and his dog. Find him turning into a big green rage monster about all of the above topics on Twitter @AlexJaySpencer.